Description: Welcome to the historic Netherwood Heights community. 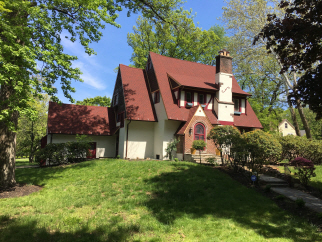 This well maintained Tudor offers historic charm with a hint of today's modern touches. Arriving at the home you are greeted by a manicured lawn. - Enter through the front door & beyond the foyer to a living room filled with character. The southern end of the home encompasses a formal dining room, den, solarium drowning with sunlight. The kitchen's finishes include new stainless steel appliances, marble countertops, farmhouse sink, pot filler, wine rack & more. Upstairs you will find 2 bedrooms a full bath and the master bedroom suite, where you can enjoy the comforts of a fireplace and ensuite bath. The 4th bedroom & 3rd full bath are located on the top floor. Finished basement has a half bath & walkout access to the inviting backyard perfect for relaxing!